There are multiple different types of number plate formats in the UK. From dateless plates to suffix plates to prefix plates to the current number plate style used today, this article will guide you through each different number plate and help you to decode your own plate. The current style of number plate has been in circulation since 2001. The plate comprises of 7 characters – 2 letters, 2 numbers, and 3 letters, as can be seen in the image below. The first 2 letters are the local memory tag which signifies the area where the vehicle was registered. The first letter indicates the region and the second the DVLA local office. The middle 2 numbers indicate the age of the vehicle from March to August or September to February. This is demonstrated in the table below. The 3 final letters are random letters which give the vehicle a unique identity. The letters I and Q are not used, neither are letters that could spell out offensive words. The first solo letter indicates the age of the vehicle and year of registration, starting at A and ending in Y. This is followed by 3 numbers that provide the vehicle with a unique ID number. The prefix format ends with 3 letters that represent the area code of the vehicle registration. In contrast to the prefix plate, the suffix registrations have the age identifier at the end of the plate, as demonstrated in the table below. These letters stop at Y. Letters I and Z are reserved for Northern Ireland registrations. Q is used for vehicles whose manufacture date is unknown. O and U are not used as they can be confused with letters Q and V.
The first 3 characters of the plate identify the area of the country where the vehicle is registered. This is followed by 3 numbers which serve as the vehicle’s unique identifier. Dateless plates were used in the UK from 1903 to 1963. These plates have no age indicator and are more desirable so are the most expensive type of private plate. Dateless plates read 1 ABC or ABC 1. 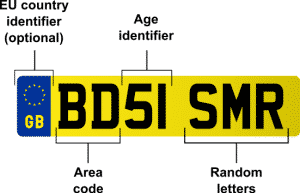 It is illegal to choose a registration that makes your vehicle appear newer than it is – but you can use a number plate that is the same age or older than your vehicle. Your number plate must not use different typefaces, it must use the mandatory plate font. It must not use stylised characters like italics or different spacings. If these guidelines are not followed your plate must be replaced. Since April 2009, you can display the flag of England, Scotland, or Wales to the left side of your plate. For further information on number plate formats or any questions you have regarding number plates, get in touch with us today or search our database of over 40 million private registration plates to find your perfect plate.